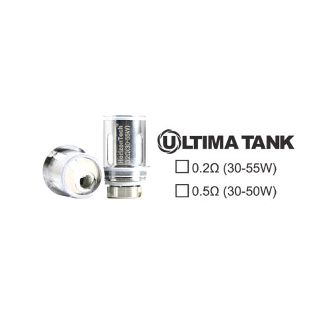 The Ultima Sub Ohm Tank Replacement Coils are available in 0.2 and 0.5 ohms. They use a circulating airflow coil system, where the coils are stacked upon each other to create their own airflow travel system. Both coils are surrounded by plenty of cotton to keep your coils plenty soaked and allow for intense flavoring and vapor!